General: Methane can of course be used in any appliance or utility that uses natural gas. The natural gas requirements of an average person with a U.S. standard of living is about 60 ft3/day. This is equivalent to 10 lbs of chicken or pig manure per day (7 pigs and 100 chickens) or 20 lbs of horse manure (about 2 horses). Other uses and methane requirements are listed in Table 11. At 25% compressor efficiency it would take 0.52 hp-hr to compress the gas (1320 BTU). In other words, it would take 1320 BTU to compress 25,300 BTU worth of gas that provides 6,350 BTU worth of work. Clearly the system is not very "efficient" in the sense that 21% of the resulting work energy is needed for compression while 75% of the available energy is lost as heat. The engine's waste heat can be recirculated in digester coils instead of dissipating in the open. Gas can be used directly as it is produced, without the need of compressors. 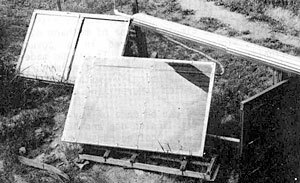 For example, bio-gas produced from pig manure was used at ordinary pressures by John Fry to power a Crossley Diesel engine. The diesel ran an electric generator and the waste heat was recirculated directly back into the digesters (Ref. 52). It is likely that bio-gas produced from mixed wastes would have to be "scrubbed" of corrosive hydrogen sulfide (by passing through iron filings), and possibly CO2 (by passing through lime water). It seems fair to conclude that anaerobic digestion is about 60-70% "efficient" in converting organic waste to methane. However, it would probably be more accurate to call this a conversion rate since, like all biological processes, a great deal of energy is required to maintain the system, and most of this extra energy is not included in the conversion. For example, consider how much energy is needed just to keep a digester warm in a general temperate climate. Direct-heating hot water boilers have an efficiency of about 70%. Gas engines have a power efficiency of 20-25% and a water heating efficiency of about 50% (Ref. 7). As hot water heaters, then, heat engines are about as efficient as water boilers. In either case about 20-30% of the gas energy derived from digestion must be put back into the system to heat digesters. Without even considering the energy needed to collect raw materials or load and clean the digesters, the conversion efficiency of digestion should be closer to 50%. Most solids not converted into methane settle out in the digester as a liquid sludge. Although varying with the raw materials used and the conditions of digestion, this sludge contains many elements essential to plant life: nitrogen, phosphorus, potassium plus small amounts of metallic salts (trace elements) indispensible for plant growth such as boron, calcium, copper, iron, magnesium, sulfur, zinc, etc. Nitrogen is considered especially important because of its vital role in plant nutrition and growth. Digested sludge contains nitrogen mainly in the form of ammonium (NH4), whereas nitrogen in aerobic organic wastes (activated sludge, compost) is mostly in oxidized forms (nitrates, nitrites). Increasing evidence suggests that for many land and water plants ammonium may be more valuable as a nitrogen source than oxidized nitrogen; in the soil it is much less apt to leach away and more apt to become fixed to exchange particles (clay and humus). Likewise, important water algae appear to be able to utilize ammonium easier than nitrates (Ref. 54). Generally speaking, this is a reversal from the earlier belief by fertilizer scientists that oxidized nitrogen always presented the most available form of nitrogen for plants. 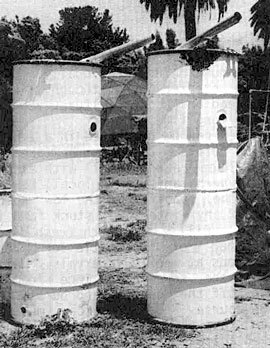 Because of these things, it has been suggested that liquid digested sludge produces an increase of nitrogen comparable with those of inorganic fertilizers in equivalent amounts (Ref. 55). Most of the information showing the poor fertilizer value of sludge has been based on municipal sewage sludge. It is a bad measure of the fertilizer value of digested sludge in general. (Municipal treatment flushes away all the fertilizer-rich liquid effluent.) In one case (Ref. 7) digested sewage sludge was found to contain only about 1/2 the amount of nitrogen in fresh sewage, whereas elsewhere (Ref. 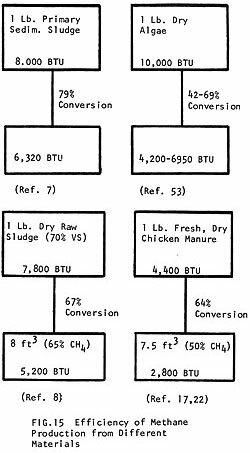 26) digested pig manure was found to be 1.4 times richer in nitrogen content than raw pig manure. Similar results have been found with digested chicken manure. Sludge from your digester can be recycled in a wide variety of ways, both on land and in water and pond cultures. The possibilities are many and only brief descriptions of potentials can be given here. Fresh digested sludge, especially from manures, contains high amounts of ammonia, and in this state may act like a chemical fertilizer by force-feeding large amounts of nitrogen into the plant and increasing the accumulation of toxic nitrogen compounds (Ref. 59, 60). There is no direct evidence for this, but the possibility exists. For this reason it is probably best to let your sludge "age" for a few weeks in an open area (oil drums, plastic swimming pools, etc. ), or in a closed container for a few months before using it on crops. The fresher it is the more you should dilute it with water before application. The continued use of digested sludge in any one area tends to make soils acidic. You should probably add a little dolomite or limestone at regular intervals to your sludge plots, allowing at least 2 weeks interval between applications to avoid excess nitrogen loss. Unfortunately, limestone tends to evaporate ammonia so you may experience a temporary nitrogen loss when you apply it on your sludge plots. Unlike digested municipal sludge, sludge from farm wastes does not contain large amounts of heavy metals or salts so there is little danger of applying it too heavily over a period of time. However, you should pay attention to the structure of your soil. If it contains a lot of clay, the sludge will tend to accumulate and possibly present problems in the root area of your plants. In general, keep close tabs on your sludge plots in the beginning until you become familiar with its behavior in your own particular soil. There are at least three general ways to integrate pond cultures with organic digesters: hydroponic crops, sludge-algae-fish and sludge-algae-methane systems. All have their advantages depending on local needs and resources. They can do away with the cost and energy of transporting liquid fertilizer to crop lands since they can be grown conveniently near to digesters. They tend to be more productive than conventional soil crops, and thus can serve as a high-yield source of fodder, compost, mulch or silage. They can serve as convenient high-yield sources of raw materials for the digester itself. Information about the use of sludge to fertilize water plants comes from projects to treat waste water in run-off areas or "sewage lagoons" (Ref. 61, 62). Some plants, for example water hyacinth, Ipomoea repens (water spinach, swamp morning-glory) and some cool season pasture grasses such as rye, fescue and canary grass, have the ability to grow well in waste water and to take up great amounts of nutrients efficiently, thus helping to control polluted waters. These crops have the added advantage that they are easy to harvest for livestock feed, thus giving an efficient method of converting sludge nutrients into animal protein. Usually, the plants are grown in shallow ponds filled with a diluted sludge solution. The process consists of slowly adding sludge under a gravel bed lining the pond and covered with a layer of fine sand. Over the sand, plants are sprouted in containers floating on the effluent that percolates up through the gravel and sand layers. After sprouting the grasses then root and anchor in the sand and gravel. Sludge-Algae-Fish: The essence of the sludge-algae-fish or "aquaculture" system consists of placing sludge into ponds and stimulating the growth of algae. The algae are then used as feed for small invertebrates or fish growing in the pond. The idea is modeled after Oriental aquaculture systems. During the last two years, under the direction of Bill McLarney, New Alchemy has established preliminary models for experimental fish cultures (Tilapia). A general description of small-scale fish farming methods using organic fertilizers and invertebrate fish food cultures has been presented elsewhere (Ref. 63--65). Sludge-Algae-Methane: In the Sludge-algae-methane system green algae is grown in diluted sludge, then harvested, dried and digested to produce methane for power and sludge for recycling. This procedure of transforming solar energy and sludge nutrients into the chemical energy of methane is potentially a very efficient and rapid biological process: (1) It is a closed nutritional system and (2) the rate of turnover is extremely high; organic matter is decomposed relatively quickly by anaerobic bacteria in the pond while it is most rapidly made by green algae. 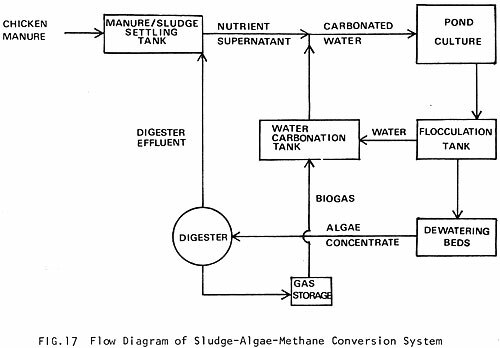 The complete sludge-algae-methane system involves a series of processes. The principle features of the system are integration of the algae culture with the gas in such a manner that nutrients and water are recycled from one process to the other (Fig. 17). 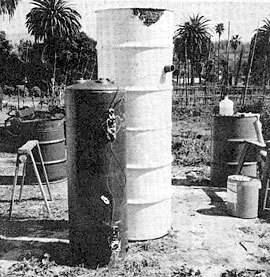 Most of the information concerning this system has been developed by researchers at Berkeley in a manner that has real potential for the homestead or small farm (Ref. 53, 66-69). Space does not permit even a brief discussion of the considerations: (1) cultivated algae, (2) pond design and operation, (3) harvesting of algae, (4) digestion of algae, (5) efficiency and yield. Hopefully, with experience, we can begin to develop practical aspects of these ideas in future Newsletters. 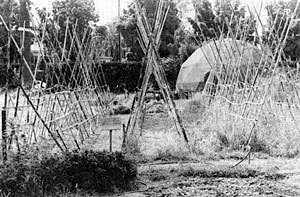 (From upper left, clockwise): Chinese bamboo trellis with lathe house in the background; drum digester heater; drum digesters; solar water heater.